Just by looking at pictures sometimes we can identify risks. We can see accidents just waiting to happen. Take a look at the pictures and quickly determine if they depict safe or unsafe situations for children. 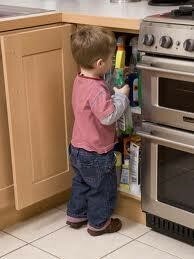 1) Photo: Child getting cleaning supplies from kitchen cupboard. Allowing a child access to cleaning supplies is unsafe. Cleaning products, medications, and other poisons must be locked closet or cabinet. 2) Photo: Child looking at toilet with child proof latch. The safest option is to keep toddlers and infants completely out of the bathroom when not supervised. If they have any access to the bathroom, then a toilet lock is the safe thing to do. The easiest way to baby proof the toilet is to keep the bathroom door shut and secured at all times. 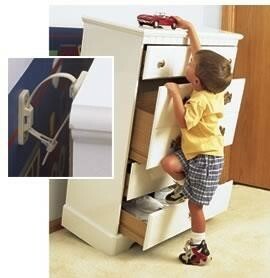 A simple way to achieve this is by installing a hook-and-eye lock high up on the bathroom door out of children's reach. This method is only reliable if you remember to lock the door each and every time you are finished using the toilet. 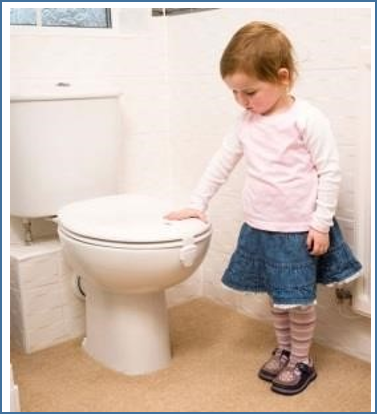 The American Academy of Pediatrics warns that the toilet is an overlooked drowning hazard to children. In 2012 the CPSC posted a report detailing all reported child deaths due to drowning. Two deaths and one injury were reported by toilet. Children are curious, uncoordinated and incredibly top heavy. If a child was to fall head first he or she could easily become stuck and drown. A baby proof toilet latch is the next best way to keep a child safe around the toilet. c. Photo: Toddler touching outlet. Allowing a child access to a power outlet is unsafe. 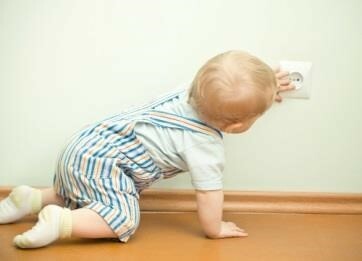 Young children, particularly toddlers, experience electric shock most often when they bite into electrical cords or poke metal objects such as forks or knives into unprotected outlets or appliances. The best way to prevent electrical injuries is to cover all outlets, make sure all wires are properly insulated, tuck wires away from your child's reach, and provide adult supervision whenever children are in an area with potential electrical hazards. d. Photo: Child climbing on dresser that is stabilized to wall. Having the dresser stabilized to the wall is a good safety measure. However, this scenario still poses a danger. Attach large furniture, such as dressers or bookshelves to the wall with safety straps, L-brackets or other strong attachment devices. This will create a safer environment even when small children are not present.